← Indulge in Healthy and Delectable Strawberry Smoothies! Everyone deserves a relaxing treat when they feel stressed out from work. Treating yourself to something is a way for you to ease your tension. What typical person doesn’t want to enjoy the fruits of their labor, right? There are tons of ways for you to reward yourself like going to the spa, dining at your favorite restaurant or cafe, going to the mall for retail shopping, or traveling to destinations you’ve never been before. Of course, there are simple treats like buying ice cream or a slice of chocolate cake. You can relieve your stress with these affordable rewards. You don’t have to splurge, especially when you want to keep your budget in check. Do you want to treat yourself with something affordable and sweet after a hard day’s work? 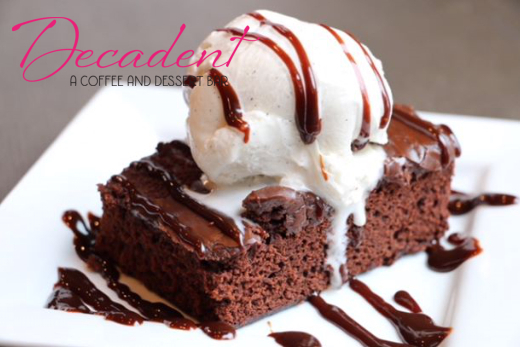 How about visiting a dessert bar in Sugar Land, Texas for some Brownie a La Mode? If you haven’t tried tasting one yet, we suggest you order it because it’s unquestionably a must-grab dessert. It can make your tensions and worries go away in a jiffy! Yes, there may be nothing fancy about a brownie cake or pie. However, when you add a vanilla ice cream on top of a freshly baked one, it makes it interesting by enhancing its flavors. You can also opt for a different ice cream flavor if you like. Just imagine a friendly staff from our coffee and dessert bar in Texas serving you a plate of warm brownie pie fresh out of the oven topped it with vanilla ice cream with a quick fudge sauce. Doesn’t the thought make your mouth water? Sharing Brownie a La Mode with a friend or loved one can even make the dessert sweeter. If you want to take a special someone in a quality coffee bar in Texas, feel free to visit our site. Don’t forget to share our Decadent Dessert Bar blog! This entry was posted in Treat Yourself and tagged Brownie Pie, Dessert, Reward. Bookmark the permalink.